What’s up in the garden! I’ve been busy in the garden. Which is why I haven’t written lately. Hard to write when so many things need to get done. Here’s the latest update. WEATHER: How about this crazy weather? Hot, cold, hot. Go figure! That’s how it is this time of year. It actually hailed 6 inches last Saturday between Harry’s Roadhouse restaurant and Seton Village Drive on Old Las Vegas Highway-a very small section of land. Drove through it right after it happened-would not have want to been in that one. Luckily we didn’t get much hail at the farm-thank you universe! Just missed us. One friend of mine was not so lucky and all her veggies got wiped out. Now it is getting warm again. HARVESTING: Still harvesting lettuces and spinach. In fact I picked almost all the spinach as it will bolt soon with the warmer weather and the lettuce will also bolt soon, so much of that is picked too. The old kale is done now. The new kale ready to go in. The rhubarb is fantastic with many stalks ready to pick. I feel a strawberry-rhubarb gallette coming soon! PLANTING: The main garden is about half weeded-Ugh! But the beds are all cleaned up and ready for all the tomatoes that will be planted next Wednesday. Now I just have to finish weeding the pathways. DRIP SYSTEMS: The drip systems are now up and running. I hate it when they act up. Sometimes it takes 2-3 days to get everything going and not leaking. Feels great when it’s done. I can’t believe it went as smoothly as it did this year. GIANT PUMPKINS: My first giant pumpkin was planted today at my friend, Deborah’s house. Hope it does well out there! Still have 3 more to plant next week here in my garden plus I have some giant long gourds and 2 giant zucchini (marrows) to put in. I’ve had trouble the last 3 years with getting any of my giant pumpkins successfully grown. Hopefully one of the pumpkins will do well this year. I have a plan! DEER! : We had some deer come and eat all the Orach (which is ok) and half of one of my grape plants (which is NOT ok). Ate the leaves and the flowers of what woulda been future grapes. I covered the rest up with row cover. Hopefully they will not explore and find the plants. There is not much in the main garden to eat so hopefully they will move on. Luckily they did not eat the garlic plants! MORE PLANTING: The peppers and eggplants starts will be planted the first week of June and the seeds of other warm season crops will go in next week too. Busy time of year! Phew! This entry was posted in general, GIANT PUMPKINS, GIANT VEGGIES-OTHER, HARVEST, rhubarb, SPRING GARDENING, SUMMER GARDENING IN SANTA FE, TOMATOES, WEEDS and tagged growing vegetables, organic vegetable gardening, vegetable gardening. Yeah, Santa Fe weather in spring is really really weird…I never quite get around to planting anything until Memorial Day weekend…but, at least I don’t lose plants to freezing temperatures, snow, hail, or hungry animals…Hooray for some degree of laziness. 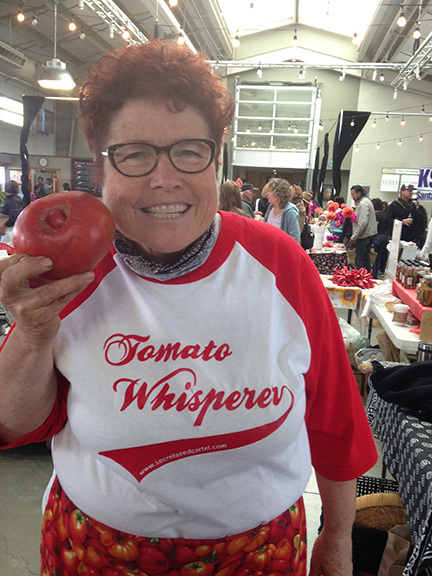 YOU GO, TOMATO LADY!!! You’re tops in my book! It’s hard to believe that you & I have so much in common garden wise – between you in NM and me in MT. We had several inches of snow last Monday, but thankfully I didn’t lose any of my fruit or lilac blossoms. Now we’ve had several days of rain. 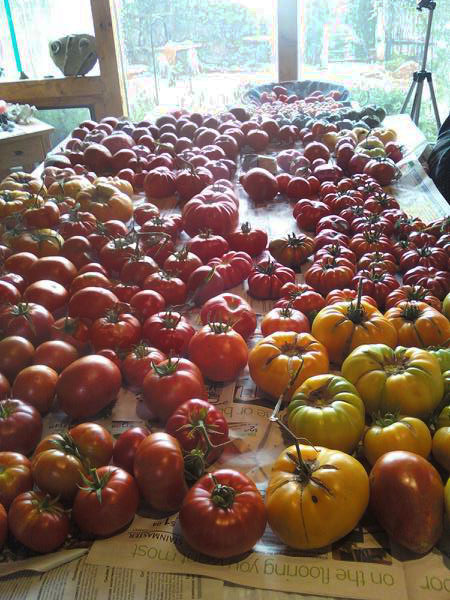 I’m glad I got my tomatoes in during the short dry spell this week. I won’t be putting my peppers out til next week, but most of my direct sow seeds are planted. And it’s almost time to sit down and rest minute, before I go weed my paths and put down a layer of fresh pine mulch. I hope your pumpkins take off this year. I am trying a new warty pumpkin called Peanut and a Hull-less Pumpkin called Syrian, but haven’t had a lot of luck with them the past few years either. Doesn’t keep me from trying again. I also got ahold of some glass corn and a red,white,&blue Indian corn that I will be planting with some scarlet runner beans and some pole black beans in a three sisters garden with those pumpkins and a winter squash / gourd mix.